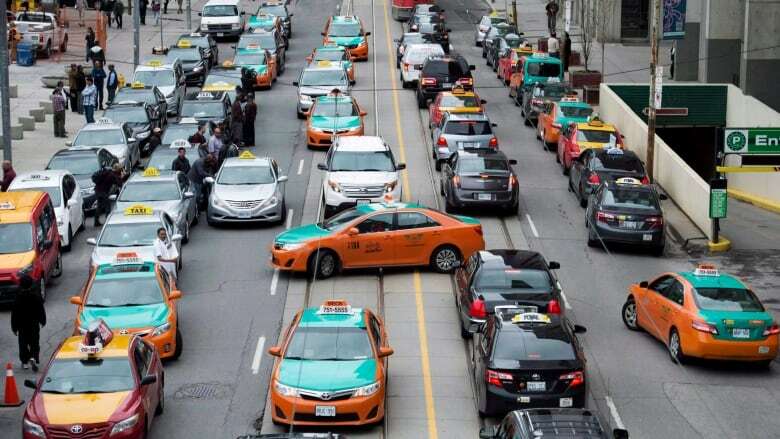 Toronto cabbies upset at how the city has handled the rise of Uber plan to stage a protest Friday that includes blocking major highways starting at 3 p.m. Some Toronto cabbies plan to block roads ahead of Friday's afternoon rush-hour with plans to slow or stop traffic on Highway 427, the Gardiner and areas around the Air Canada Centre, a cab industry representative told CBC News Wednesday. The cabbies, angry at how the city has handled the rise of Uber, say they're timing their protest to begin as thousands of visitors arrive for the NBA All-Star Weekend and the International Auto Show. Cab drivers say the ride-hailing app UberX is taking away their business while operating illegally. 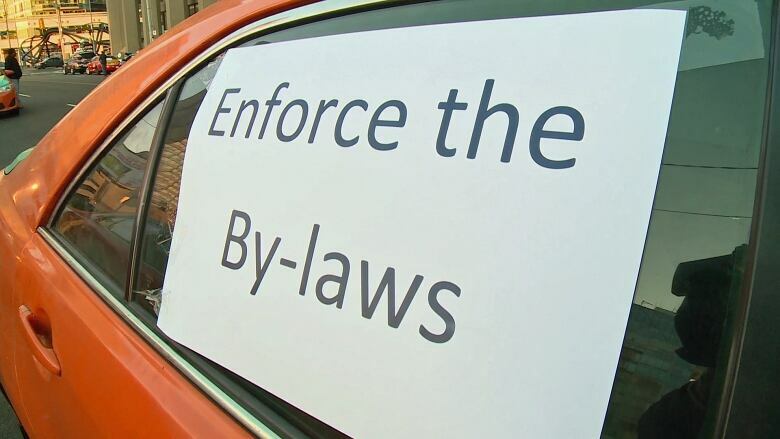 The city is working to create new bylaws that will encompass Uber, but those new rules won't come until at least April. Paul Sekhon is a general manager at City Taxi and organizer of this weekend's protest. He also heads the United Taxi Workers Association, a newly formed umbrella group of taxi industry organizations opposed to Uber. Sekhon appeared on Metro Morning today and host Matt Galloway pressed him for more details about the protest. Here's how the exchange went down. The following Q&A is edited for length and brevity. Matt Galloway: "What do you expect to see on the streets of Toronto this weekend?" Sekhon: "It's pretty much they're going to be saying their frustration about the lack of leadership from Mayor John Tory. That's what's going to be happening." Galloway: "But actually what's going to happen on the roads?" Sekhon: "It will be a job action. Demonstration on the streets." Galloway: "How many cab drivers are you expecting to not work?" Sekhon: "We're committed to about 8,000 vehicles right now"
Galloway: "Eight thousand? So are they just not going to pick up passengers? I'm going to ask this for a third time: What exactly is going to happen this weekend?" Sekhon: "We're going to be blocking the roads and just going to be demonstrating like we did on Dec. 9." Galloway: "Why are you doing it this weekend?" Sekhon: "This is the time I believe we can get international media. The whole world will know how poor our leadership is from Mayor Tory and how he's encouraging the people to use an illegal service like UberX over the taxis which have been legal in Toronto for five, six decades now. These are the law-abiding taxis that deserve to be staying alive, rather than somebody that's been coming in killing us slowly." Galloway: "But the mayor has said this won't do anything to speed up the process to change the bylaws. So what are you going to actually achieve by doing this?" Sekhon: "We're going to achieve the shame of the mayor and of the poor leadership skills, we want the world to know." Galloway: "So this is just about making the mayor look bad. It's not about actually achieving anything?" Sekhon: "That's correct. We know nothing usually comes out of demonstrations right away, but last time at Pan-Am Games [Tory] gave us a lollipop, pretty much said 'Don't go on strike and I'm going to come out and say UberX is illegal.' He never said that. All he said is they are operating outside the law to confuse the Torontonians." Galloway: "Do you think you have sympathy from Torontonians for the plight of taxi drivers?" Sekhon: "Yes we do that's why we still have clients, that's why we still have passengers in the back of these cabs. But the sympathy should also be coming also from the elected officials. They should understand that we've been supporting the legal Canadian system. That's why we're in this country." Galloway: "Do you think the sympathy you believe you have will continue if people can't get a taxi on this busy weekend?" Sekhon: "Yes, certainly by 100 per cent. The people still understand that we're still humans doing our job and we deserve our voices to be heard ...that's why we're protesting." The UberX app connects cars with drivers willing to pay for a ride. 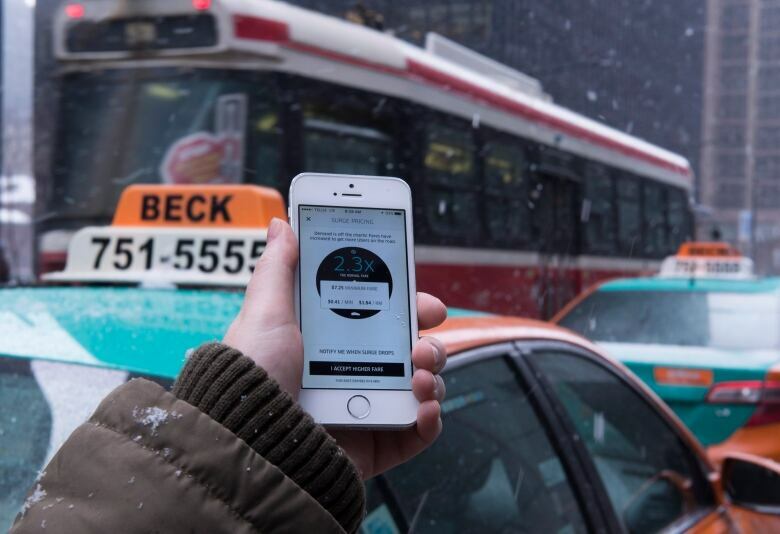 The city has asked Uber to cease operations while new taxi bylaws are written, but the popular ride-hailing service has continued to operate. Galloway: "Are you serious? You still believe that? You think that if people can't get a cab, they're not going to take this out on you? They're not going to choose Uber instead?" Sekhon: "No, when people are angry, they're angry for a day or two and then they'll be back to normal. They understand we're the ones driving around for the last 40 or 50 years. We're not doing anything wrong, we're just standing up for our rights ... and telling them to enforce the law." Galloway: "The head of Beck taxi says her drivers will not take part, that this action would give Uber exactly what its wants. What do you say to that?" Sekhon: "I don't believe that. The last time we had drivers from Beck, Co-Op, Diamond, Royal involved. I'm the front-line guy representing the drivers. We represent 80 per cent of the drivers in the city." Galloway: "You've been captured on camera disrupting city council, hurling obscenities at the mayor and members of city council. What should we make from that behaviour?" Sekhon: "The mayor has been playing delay tactics with us. It's a build up of frustration. We just watch them dictate how they want us to run our industry when it's been running fine for years. When somebody is taking the bread and butter away from you and they've got nothing else coming in, you're going to expose yourself how you want. We've lost a lot of things." Galloway: "What does it say about your industry when that's what we see?" Sekhon: "It shows we're very frustrated. And we've been played around like kids." Galloway: "The mayor has said police can take whatever steps they deem appropriate if you protest. What do you expect they'll do if you protest?" Sekhon: "I believe the police are going to do what they have to do. They aren't going to take any advice from me."